On February 14, 2018, 19-year-old Nikolas Cruz slaughtered two faculty members and 15 students at Marjory Stoneman Douglas High School in Parkland, Florida. 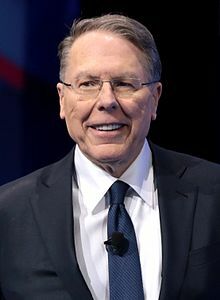 NRA CONGREGATION: Praise Him! Praise Him! My Strength and my Redeemer! In 2012, a psychotic gunman slaughtered 20 first-graders and six adults at Sandy Hook Elementary School. Since then, at least 1,862 mass shootings have erupted nationwide,with at least 2,071 killed and 7,852 wounded. In it, the brilliant and ambitious physicist, J. Robert Oppenheimer (played by Dwight Schultz) comes—too late—to realize he’s made a deal with the devil. The same proved true for the J. Robert Oppenheimer of history. In 1942, America’s top military officials become convinced that German scientists are furiously pursuing work on an atomic bomb. The full horror of the extermination camps has not yet been revealed. But “Oppie” and many other Jewish scientists working on the Manhattan Project can easily imagine the fate of Jews trapped within the borders of the Third Reich. This spurs them on to frenzied efforts to build a bomb that will quickly end the war and end that suffering. But then something unforeseen happens. On May 8, 1945, the Third Reich collapses and signs unconditional surrender terms. Almost at the same time, the U.S. military learns that although some German physicists had tried to make an atomic bomb, they never even got close to producing one. Oppenheimer now finds himself still working to build the most devastating weapon in history—but now lacking the enemy he had originally signed on to destroy. Meanwhile, the U.S. Government has invested nearly $2 billion in the Manhattan Project—at a time when $2 billion truly meant the equivalent of $1 trillion today. Is all that money to go for nothing? Oppenheimer doesn’t have to make that decision. 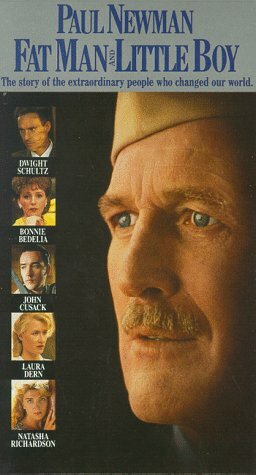 It’s made for him—by his immediate superior, General Leslie Groves (Paul Newman), by Groves’ superiors in the Army, and ultimately by the new President, Harry S. Truman. Oppenheimer, who has taught physics at the University of California at Berkeley, now finds himself being taught a lesson about the physics of bureaucracy: That, once set in motion, bureaucracies—like objects—continue to move forward unless something intervenes to stop them. 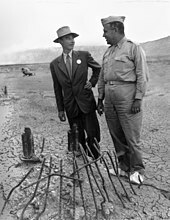 For Oppenheimer, the three years he’s devoted to creating an atomic bomb will prove the pivotal event of his life. He will be praised and damned as an “American Prometheus,” who brought atomic fire to man. Countless Americans—especially those who would have been ordered to invade Japan—revere him for bringing the war to a quick end. And countless Americans condemn him as a man whose arrogance and ambition have enabled mankind to destroy itself. Faced with the massive toll of lives taken by the device he had created, Oppenheimer became convinced that the only hope for humanity lay in abolishing nuclear weapons. He vigorously opposed the creation of a “super” hydrogen bomb. His advice was overruled, however, and construction of this went forward at the same pace that Oppenheimer had once driven others to create the atomic bomb. The first test of this even more terrifying weapon occurred on November 1, 1952. By 1953, just as Oppenheimer predicted, the Soviet Union launched its own H-bomb test. Although Oppenheimer returned to teaching, at Princeton University, he never recovered from the shame of having lost his security clearance. A chain smoker, he died of throat cancer in 1967. On February 6, 2011, Ronald Reagan, if he had been alive, would have been 100 years old. Publishers rushed to put out worshipful tributes to his eight years as President. Network political programs such as “This Week” and “Meet the Press” assembled surviving members of his administration to re-live the “glory days” of Reagan’s–and their–time in power. This is where it all started going wrong for America–a Right-wing legacy of huge Federal deficits, tax-cuts for the rich, bloated military budgets and cutbacks in government programs to aid the poor and middle-class. No two men could have been more different than Vladimir Lenin and Ronald Reagan. Lenin created the Soviet Union in 1917 and became its first in a series of absolute dictators. Reagan spent his life fighting Communism, most notably as President. So it’s ironic that both men, in death, got essentially the same funeral–and for the same reason: To sanctify and legitimize their respective organizations–and the authority of their potential successors. Lenin died in 1924 and was immediately succeeded by Joseph Stalin. Stalin knew that, despite Communism’s official atheistic stance, most Russians remained loyal to the Russian Orthodox Church. So in giving Lenin’s funeral oration, Stalin used the language of religion to confer sainthood upon a militant atheist–and upon his successor, Stalin himself. Stalin and his fellow Communists immediately launched the “cult of Lenin,” depicting him as a fatherly, all-wise leader whose genius could only be bestowed upon his closest disciples. Lenin’s extensive political writings were treated as divine writ, and were used to justify everything Stalin and his own successors wanted to do. Similarly, the Republican party wasted no time turning its own former leader, Ronald Reagan, into a modern-day saint of mythical proportions. They have done so for the same reason that Stalin deliberately forged a cult around the dead Lenin—to create a “holy” figure of whom other Republicans can claim to be true disciples. Reagan was only one of a series of Presidents who held the line against the Soviet Union. His budgets were just as stained with red ink as those of all previous Presidents. Far from standing up to Iranian terrorists, Reagan sold them our most sophisticated missiles in a weak-kneed exchange for American hostages. Then he went on television and brazenly lied that any such “arms for hostages” deal had ever happened. By the end of his term, 138 Reagan administration officials had been investigated, indicted or convicted for official misconduct and/or criminal violations. By drastically shrinking the tax-base, bloating the defense budget and destroying programs to benefit the poor and middle-class, Reagan produced a $1 trillion deficit—which only the Clinton Administration eliminated. Reagan believed that government should not help the impoverished. Those who lacked wealth to buy such necessities as housing and medical insurance were written off as unimportant. John F. Kennedy had praised government service as an honor. Reagan repeatedly said that “the best and the brightest” could be found only in business. This denigration of government service continues among Republicans to this day–defaming the very institutions they lust to control. Although he often berated the poor for their “laziness,” Reagan adhered to a “banker’s hours” schedule: During his working hours in the Oval Office, he often had blocks of free time–two to three hours. He would call for his fan mail and answer it. Reagan famously attacked “welfare queens” and sought to deny government benefits for the poor. But he didn’t hesitate to enrich himself at public expense. Before his Presidency ended, 18 wealthy Californians contributed $156,000 apiece to buy him a 7,200 square-foot mansion overlooking Beverly Hills. Reagan signed a multi-million dollar deal to write his Presidential memoirs and publish a collection of his speeches. He signed an exclusive contract with a Washington lecture bureau, which paid him $50,000 per speech given in the United States and $100,000 overseas. This made him the highest-paid speaker in the country. These monies came in addition to his Presidential pension of $99,500 a year for life and his $30,000 annual pension as a former governor of California. At a cost to the government of $10 million annually, Reagan–a millionaire who could afford private security–continued to receive lifetime Secret Service protection from 40 fulltime agents. The “cult of Lenin” died when the Soviet Union collapsed in 1991. The “cult of Reagan” continues to flourish, and will do so for as long as the Republican party finds voters willing to believe in it. Then something unforeseen happens. On May 8, 1945, the Third Reich collapses and signs unconditional surrender terms. Almost at the same time, the U.S. military learns that although German physicists had tried to make an atomic bomb, they never even got close to producing one. Witnessing the first successful atomic explosion, Oppenheimer had been stunned by the sheer magnitude of destructiveness he had helped unleash. The first test of this even more terrifying weapon occurred on November 1, 1952. By 1953, just as Oppenheimer had predicted, the Soviet Union had launched its own H-bomb test. 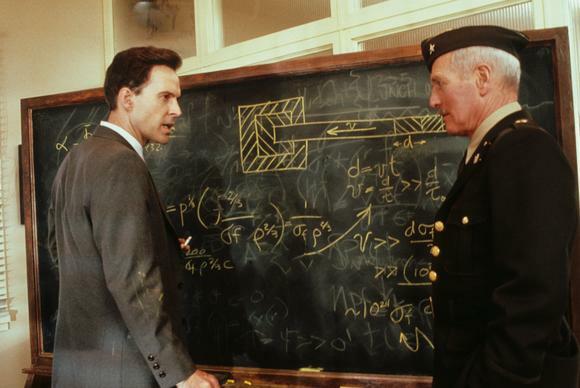 In the 1989 movie, Fat Man and Little Boy, the brilliant and ambitious physicist, J. Robert Oppenheimer (played by Dwight Schultz) comes–too late–to realize he’s made a deal with the devil. Hired by Army General Leslie Groves (played by Paul Newman) to ramrod construction of an atomic bomb, Oppenheimer has no qualms about using it against Nazi Germany. It’s believed, after all, that German scientists are furiously pursuing work on such a weapon. And even though the full horror of the extermination camps has not yet been revealed, “Oppie” and many other Jewish scientists working on the Manhattan Project can easily imagine the fate of Jews trapped within the borders of the Third Reich. But then something unforeseen happens. On May 8, 1945, the Third Reich collapses and signs unconditional surrender terms. Almost at the same time, the U.S. military learns that although some German physicists had tried to make an atomic bomb, they never even got close to producing one. So Oppenheimer finds himself still working to build the most devastating weapon in history–but now lacking the enemy he had originally signed on to destroy. Meanwhile, the U.S. Government has invested nearly $2 billion in the Manhattan Project–at a time when $2 billion truly meant the equivalent of $1 trillion today. Is all that money to go for nothing? Oppenheimer doesn’t have to make that decision. It’s made for him–by Groves, by Groves’ superiors in the Army, and ultimately by the new President, Harry S. Truman. That the Japanese lack the technological skill of the Germans to produce one doesn’t matter. That they are rapidly being pushed across the Pacific to their home islands doesn’t matter. That American bombers are incinerating Japanese cities at will doesn’t matter. That they are desperately trying to find a way to surrender without losing face doesn’t matter. What matters is that Pearl Harbor is still fresh in the minds of Americans generally and of the American military in particular. And that now that the Japanese are being pushed back into their home islands, they are fighting ever more fanatically to hold off certain defeat. General Douglas MacArthur, who is scheduled to command the invasion of Japan, has estimated a million American casualties if this goes forward. Oppenheimer, who has taught physics at the University of California at Berkeley, now finds himself being taught a lesson: That, once set in motion, bureaucracies–like objects–continue to move forward unless something intervenes to stop them. And, in this case, there was no one willing to say: Stop. So, on August 6, 1945, an American B-29 bomber dropped “Little Boy” on Hiroshima. An estimated 80,000 people died instantly. By the end of the year, injury and radiation brought total casualties to 90,000-140,000. On August 9, it was the turn of Nagasaki. Casualty estimates for the dropping of “Fat Man” ranged from 40,000 to 73,884, as well as another 74,909 injured, and another several hundred thousand diseased and dying due to fallout and other illness caused by radiation. Countless Americans–especially those who would have been ordered to invade Japan–will revere him as the man who brought the war to a quick end. And countless Americans–and non-Americans–will condemn him as a man whose arrogance and ambition led him to arm mankind with the means of its own destruction. Faced with the massive toll of lives taken by the device he had created, Oppenheimer became convinced that the only hope for humanity lay in abolishing nuclear weapons. He insisted that they should be placed under international control. And he tried to persuade American leaders of the dangers of an unchecked arms race. The climax of his anti-bomb efforts came when he vigorously opposed the creation of a “super” hydrogen bomb. His advice was overruled, however, and construction of this went forward at the same pace that Oppenheimer had once driven others to create the atomic bomb. It didn’t. Accused during the hysteria of the Joseph McCarthy witch-hunts of being a Communist traitor, Oppenheimer found himself stripped of his government security clearance in 1954. Just as he had been unable to prevent the military bureaucracy from moving relentlessly to use the atomic bomb, so, too, was he unable to halt the political bureaucracy from its own rush into cowardice and the wrecking of others’ lives.